Collection of ritual and civil laws, the meaning of the title being "all is in it"; who its author was has not yet been ascertained. The work in content resembles earlier codes, as, for instance, the Ṭurim or the "Orḥot Ḥayyim," though in its form it is very different; it does not pretend to any order; the laws of the Oraḥ Ḥayyim are found among the laws of the Yoreh De'ah and those of the Eben ha-'Ezer among those of the Oraḥ Ḥayyim;many laws are entirely missing in the "Kol Bo." It is peculiar in that some of the laws are too briefly stated, while others are stated at great length, without division into paragraphs. After the regular code, terminating with the laws of mourning (No. 115), there comes a miscellaneous collection, containing the "taḳḳanot" of R. Gershom and of Jacob Tam, the "Ma'aseh Torah" of Judah ha-Nasi I., the legend of Solomon's throne, the legend of Joshua b. Levi, a cabalistic dissertation on circumcision, a dissertation on gemaṭria and noṭariḳon, sixty-one decisions of Eliezer b. Nathan; forty-four decisions of Samson Zadok (TaShBeẒ), decisions of Isaac of Corbeil, and responsa of Perez ha-Kohen, decisions of Isaac Orbil, of the geonim Naṭronai, Hai, Amram, Nahshon, laws of the "miḳweh" taken from Perez's "Sefer ha-Miẓwot," responsa, and finally the law of excommunication of Naḥmanides. For this reason it is quoted under the title of "Sefer ha-Liḳḳuṭim" in "Abḳat Rokel," No. 13. 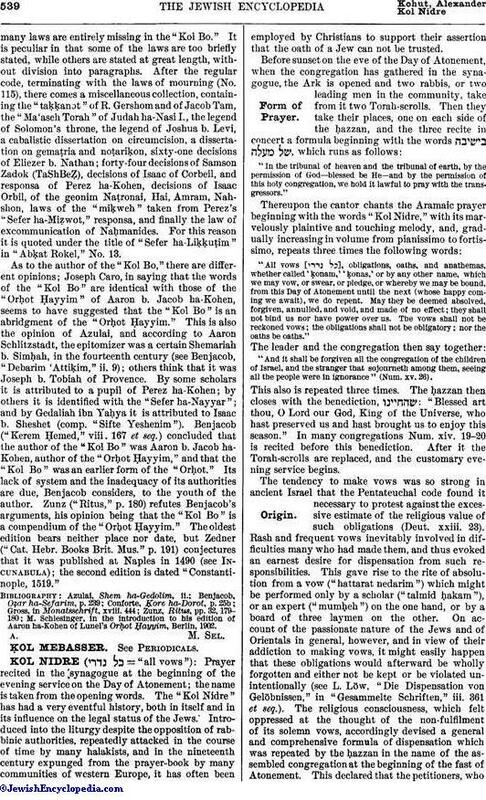 As to the author of the "Kol Bo," there are different opinions; Joseph Caro, in saying that the words of the "Kol Bo" are identical with those of the "Orḥot Ḥayyim" of Aaron b. Jacob ha-Kohen, seems to have suggested that the "Kol Bo" is an abridgment of the "Orḥot Ḥayyim." This is also the opinion of Azulai, and according to Aaron Schlitzstadt, the epitomizer was a certain Shemariah b. Simḥah, in the fourteenth century (see Benjacob, "Debarim 'Attiḳim," ii. 9); others think that it was Joseph b. Tobiah of Provence. By some scholars it is attributed to a pupil of Perez ha-Kohen; by others it is identified with the "Sefer ha-Nayyar"; and by Gedaliah ibn Yaḥya it is attributed to Isaac b. Sheshet (comp. "Sifte Yeshenim"). Benjacob ("Kerem Ḥemed," viii. 167 et seq.) 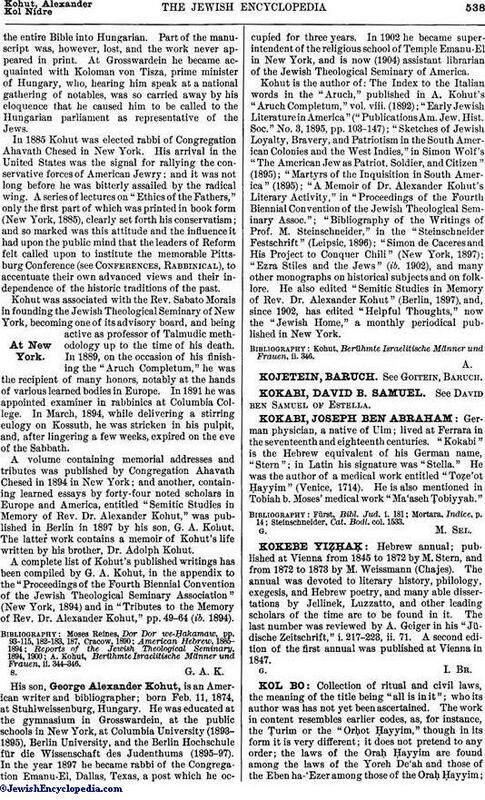 concluded that the author of the "Kol Bo" was Aaron b. Jacob ha-Kohen, author of the "Orḥot Ḥayyim," and that the "Kol Bo" was an earlier form of the "Orḥot." Its lack of system and the inadequacy of its authorities are due, Benjacob considers, to the youth of the author. Zunz ("Ritus," p. 180) refutes Benjacob's arguments, his opinion being that the "Kol Bo" is a compendium of the "Orḥot Ḥayyim." The oldest edition bears neither place nor date, but Zedner ("Cat. Hebr. Books Brit. Mus." p. 191) conjectures that it was published at Naples in 1490 (see Incunabula); the second edition is dated "Constantinople, 1519." M. Schlesinger, in the introduction to his edition of Aaron ha-Kohen of Lunel's Orḥot Ḥayyim, Berlin, 1902.